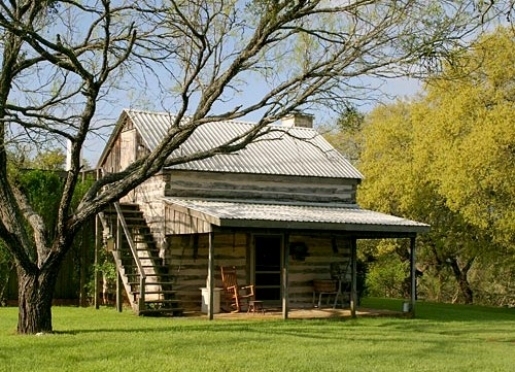 This original farm house, built around 1875, is perfect for small groups of family and friends. 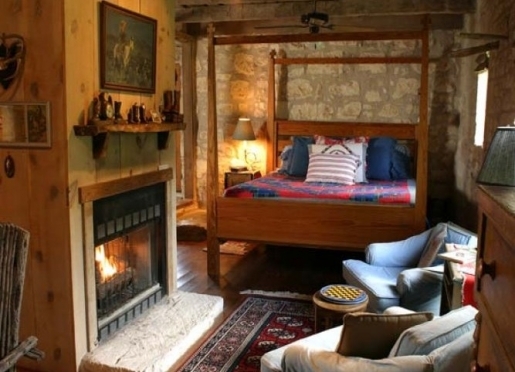 Downstairs offers a great room with a wood burning fireplace, comfy sitting areas and an antique farm dining table. 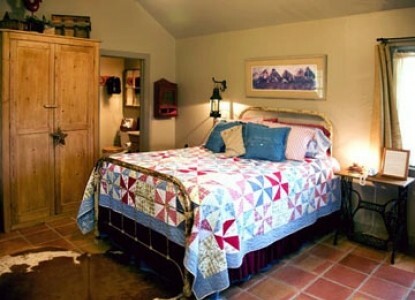 The downstairs bedroom has a queen-size bed, and the bath has a claw foot tub with hand-held shower. Enjoy making meals in the fully equipped kitchen, complete with range/oven, refrigerator, microwave, dishwasher and coffeemaker. 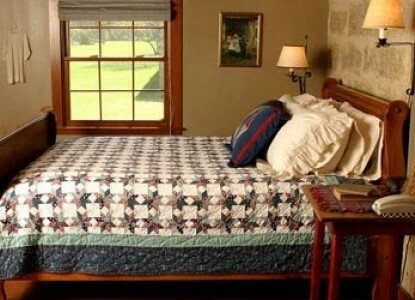 Watch deer feeding in the surrounding countryside from the front porch, which also has a day bed sleeping 2 people. 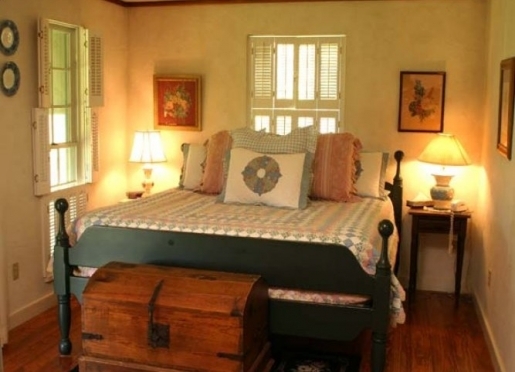 Walk up the original staircase to find an upstairs room with a queen-size bed and a large bathroom with a shower. Bunk beds provide additional sleeping space upstairs. Downstairs bath has a claw foot tub with hand-held shower. Upstairs bath has shower. 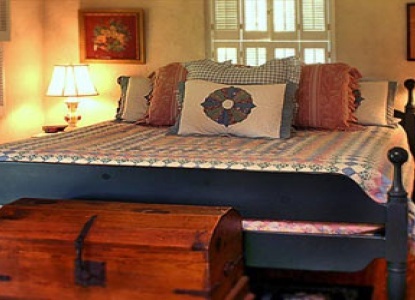 Sleeps 2–6 persons. Queen bed upstairs and queen bed downstairs. Day bed on sleeping porch has two twins and there is also a bunk bed upstairs. Fully equipped kitchen includes stove/oven, refrigerator, microwave, dishwasher and coffeemaker. Continental plus breakfast is left for you. $350.00 1–4 persons/night. 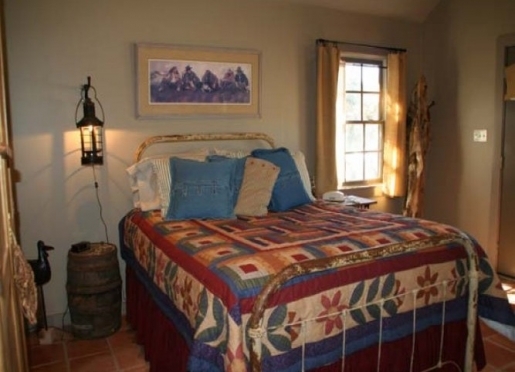 $50.00 for each extra person/night (up to total of six people). There's also a 13% tax. Two night minimum on weekends. 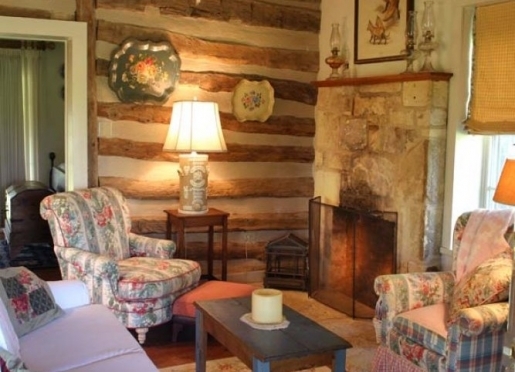 The Log Cabin is the first structure that was built on this historic homestead around 1854. Located in the cabin where the Itz family raised nine children, enjoy all of today's modern amenities while reflecting on the life of early pioneers. 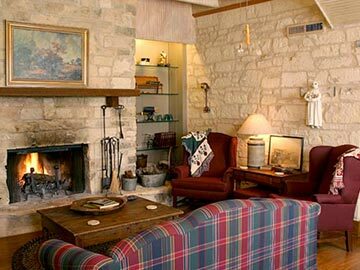 Enjoy a romantic evening in front of the fieldstone fireplace and set the mood with special music or a nostalgic movie. 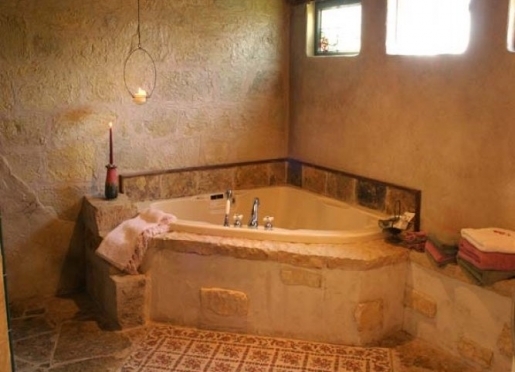 The bathroom provides the ultimate romantic bathing experience. 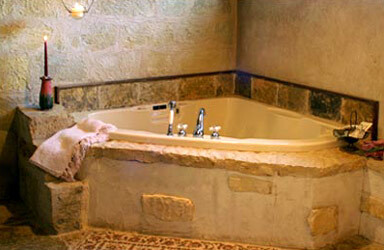 The look of a natural limestone floor and a cedar ceiling supported by juniper beams provide the perfect setting for the whirlpool tub for two tucked into the corner. 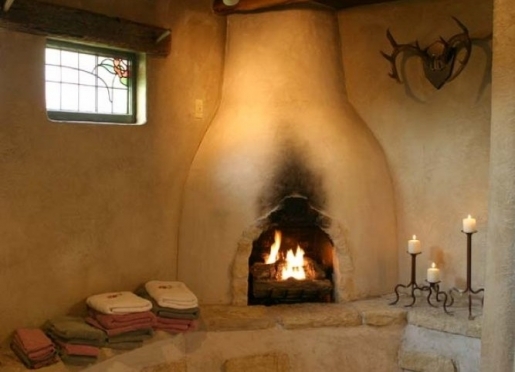 You will be delighted by a small kiva fireplace to warm your bath on chilly evenings. 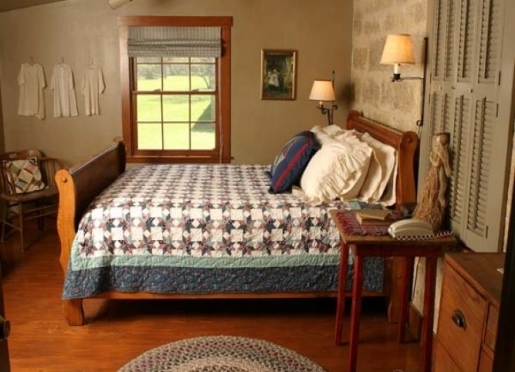 Let the fresh Hill Country breezes and the songs of Mother Nature lull you to sleep. In the morning, step through the French doors to the secluded back porch. Relax in the swing and enjoy a breath-taking view of Palo Alto Creek while enjoying your morning coffee. 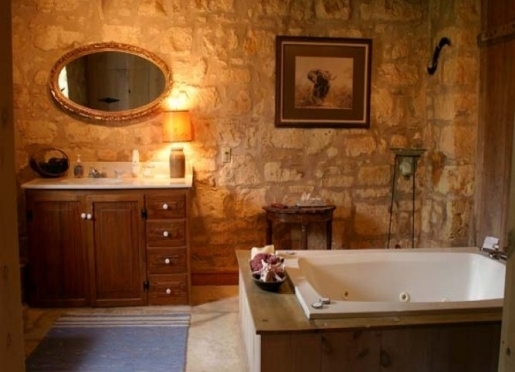 Private bath with large whirlpool tub, separate shower, and small fireplace. 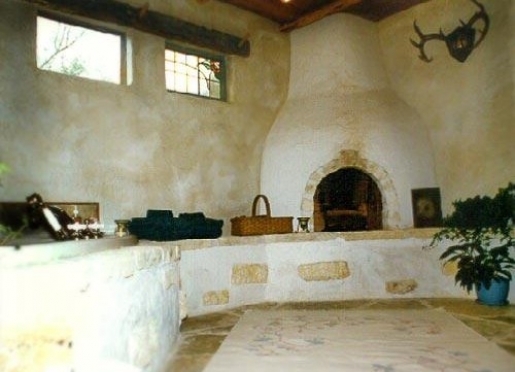 A second gas fireplace in the living room. Kitchen includes refrigerator, microwave, stove/oven, sink and coffeemaker. $225.00 per 1–2 persons/night. There's also a 13% tax. Two night minimum on weekends. 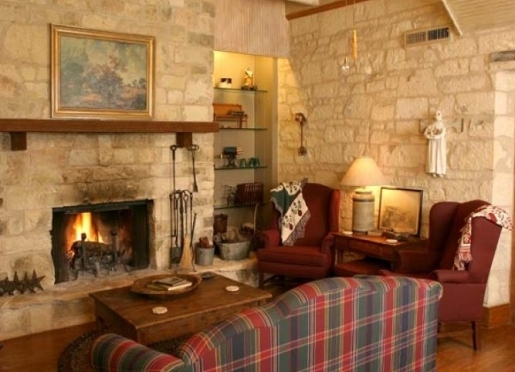 The Barn, a limestone structure built around 1880, had humble beginnings housing livestock. 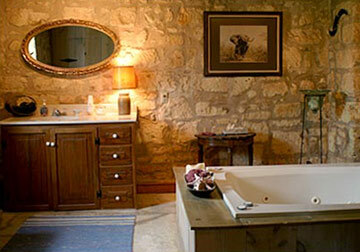 Today it has been meticulously renovated to provide guests the maximum in country elegance and luxury. Windows provide a view of ancient Oak trees and beautiful lawns. 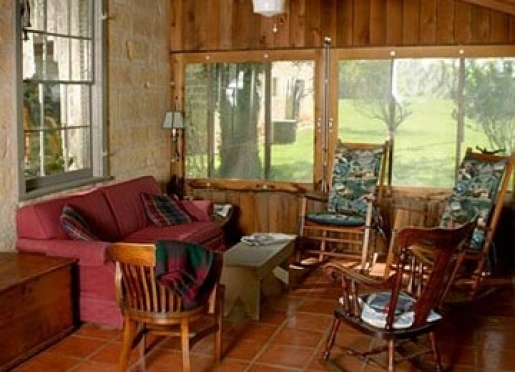 The secluded vine and lattice covered porch is a perfect place to enjoy morning coffee and greet the beautiful Hill Country day. 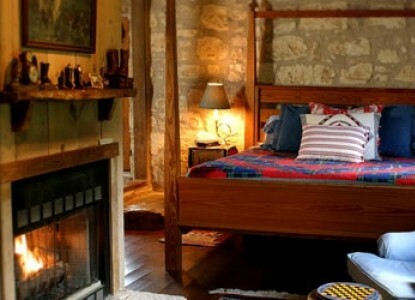 Relax in the two cozy chairs while watching the firelight shadows dance across the limestone walls from the king-size pine pencil post bed, nestled down in fine linens and plump pillows. 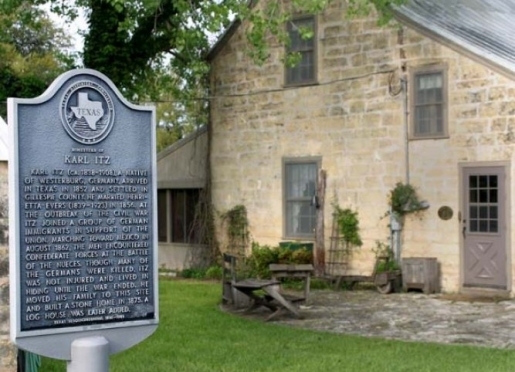 Antiques and folk art abound, including an original lightning rod from the Itz farm house. The bathroom features a whirlpool tub for two, encased in bleached white pine and resting on large slabs of native limestone. Sunlight, or starlight, filters in through a leaded glass window and skylight. Private bath with large whirlpool tub, handheld shower. Coffee bar includes sink, refrigerator, microwave and coffeemaker. 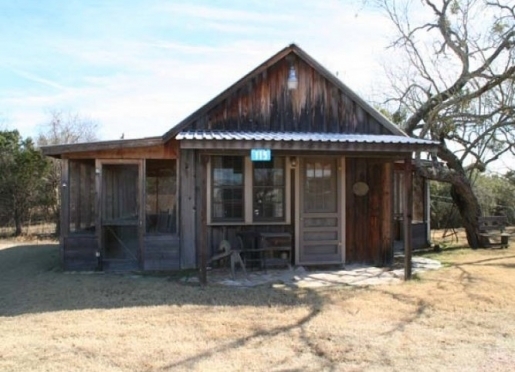 Before becoming a special accommodation furnished and decorated with rustic antiques, the Hideaway began as a single-car garage and later served as an office. After a good night's sleep, start the day off in the large, walk-in shower of tumbled marble. Relax in the fresh country air on the wraparound screened porch. Room heat and air conditioning. $165.00 per 1–2 persons/night. There's also a 13% tax. Two night minimum on weekends. 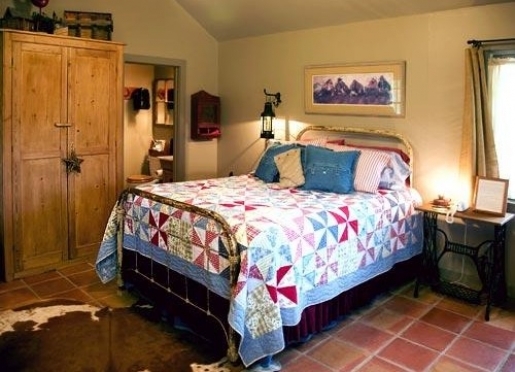 We hope you don't have to cancel your stay at Palo Alto Creek Farm; but, if you should cancel within ten days of your confirmed arrival date, and we cannot rebook your reservation, you will be subject to one night's lodging charges. If you cancel at any other time there is a $30.00 charge. Early departures will be charged for the whole amount of their reserved stay. No-shows will be charged for the whole amount of their reserved stay. Per night rates listed do not include tax and are subject to change without notice. Credit Cards: We accept Visa, MasterCard, American Express and Discover. All reservations must be guaranteed with a valid credit card or cash payment in advance. 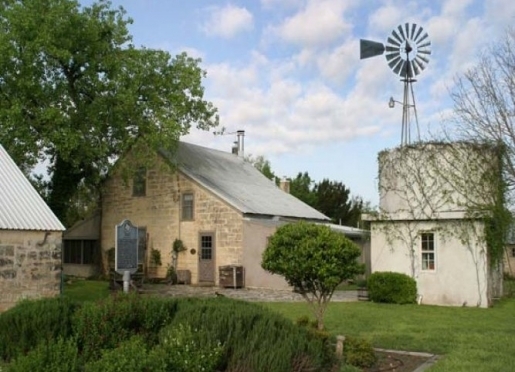 Smoking: Palo Alto Creek Farm is smoke-free. Smoking is not permitted anywhere on the premises. If you are a smoker, you will be more comfortable elsewhere. Children: The Itz House can accommodate parties with children age 12 and over. The Barn, The Hideaway and The Log Cabin are not suitable for children. 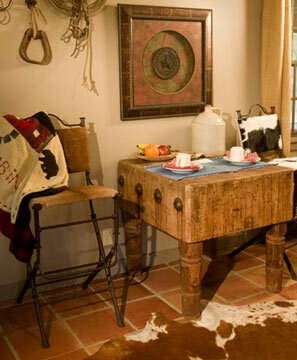 Breakfast: A Continental Plus breakfast is provided for guests at Palo Alto Creek Farm to enjoy at your leisure and in the privacy of your guest house. 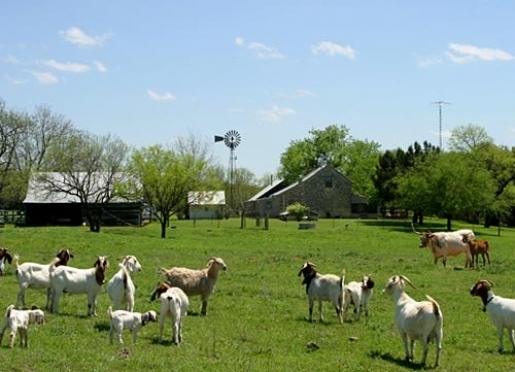 Pets: Because of the resident animals at Palo Alto Creek Farm, pets cannot be accommodated. Thank you for making an inquiry about staying at Palo Alto Creek Farm.